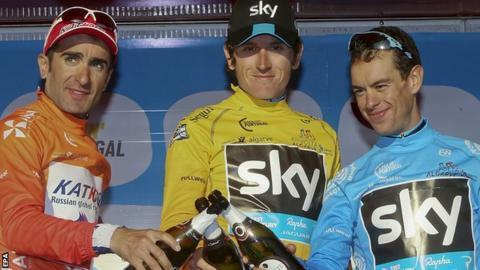 Team Sky's Geraint Thomas has won the five-stage Volta ao Algarve for his fourth career stage-race victory. The Welshman held a 27-second lead going into the final stage - won by German Andre Greipel - and stayed out of trouble to secure overall victory. Thomas, who had led the race after winning stage two, said: "I don't get to win very often so it's really nice." The 28-year-old's victory came on the same day that Team Sky's Chris Froome won the Ruta del Sol in Spain. Thomas's only other stage-race wins had been in the Bayern-Rundfahrt, which he won in both 2011 and 2014 and the Fleche du Sud in 2006. He added: "You look at the previous winners and there are a lot of strong guys there. There's a lot of strong teams here too. "We've got a big month ahead with Paris-Nice and the classics. The form seems to be building nicely so I'm looking forward to the next few weeks."